Good question. Let’s start with just a brief overview of protein chemistry (please don’t leave I’ll make this as painless as possible and it’s important in considering the big picture). Proteins are chain like molecules made up of amino acid sub units. There are 20 different amino acids and countless unique arrangements of these sub-units make for an infinite number of potential proteins. However, the structure of a functioning protein is more complicated than just the amino acid sequence. 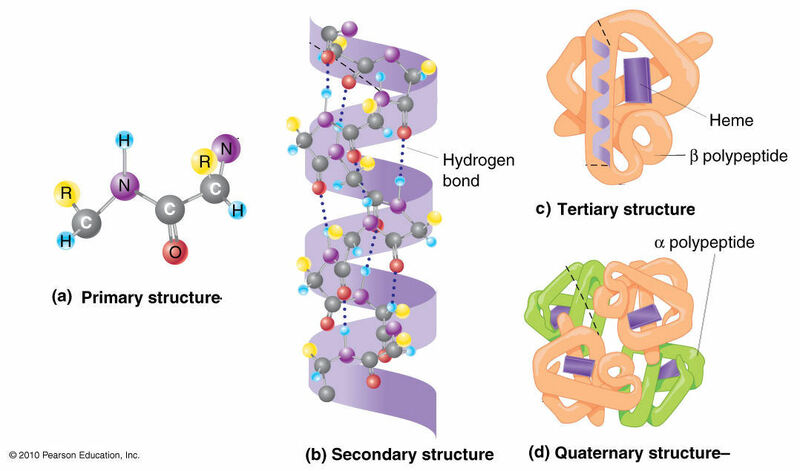 Protein chains, through weak chemical bonds, form additional structural components: secondary, tertiary and quaternary structures. These hierarchical structures are a result of folding, coiling and joining with other protein chains and are vital for functionality. These weak chemical bonds that define a protein remain intact within only a relatively narrow range of physical conditions. 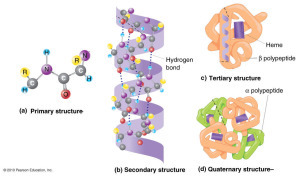 Changes in temperature and acidity disrupt these weak bonds essential to maintaining the intricate protein structure and the loss of this structure is referred to as denaturation and is accompanied by a loss of function (1). What are consequences of denaturing protein? Well, if you a living organism and the proteins that you rely on for structure and function are denatured, you are in real trouble. Kind of like totaling your car, your car may still be in one piece, but it is little good to you with an altered geometric structure. However, we are considering potential drawbacks of denaturing proteins that you are consuming, not motor vehicles. Consider that the first thing that happens when protein hits your stomach is it denatures, where the pH can drop as low as 1 or 2 from a high protein meal. Additionally, enzymes are present in the stomach that instantly begin cleaving the bonds between amino acids thus fragmenting the protein. The goal of digestion is to completely cleave proteins into individual amino acids so that they may enter the blood stream becoming available for metabolism (2). Therefore, the denaturation of protein is unavoidable and necessary for digestion. Take the car example again, although it doesn’t function it still has the raw materials; steel, rubber, etc. to build a new car. In digestion the only way to utilize proteins is to first break them into all their amino acids sub-units, which are the largest units capable of passing through the intestine walls. You will not and cannot consume a functional protein and later use that protein for your own purposes. Are there any reasons to avoid denaturing protein before consumption? So, if a protein is denatured as soon as it hits your gut, is there any disadvantage to it being denatured before consumption. The answer is yes or no, depending on the protein. Food processing through heating or cooking can influence protein digestibility both beneficially and detrimentally. 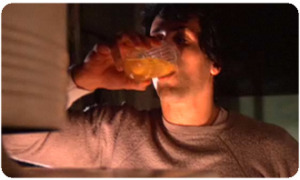 An example of being beneficial: Egg whites. Raw egg whites are less digestible than heat treated or cooked whites. The denaturing of the proteins before consumption allows the enzymatic processes in the intestines to better absorb and utilize the amino acids (3). The denaturing of proteins does not always improve digestibility as denaturation can lead to restructuring of the protein molecule that reduces accessibility to digestive enzymes. What are the consequences of denaturing whey on digestibility? So, we finally arrived at the specific question of cooking whey protein concentrate. First, heating to temperatures above 158°F (70°C) can cause denaturation of whey (4). Second, as the temperature exceeds 158°F and the longer the duration of heating, the less digestible and the less available the amino acids become. However, it should be pointed out that amino acids are not being destroyed by heating, but instead the protein experiences structural modifications which impairs enzymatic liberation of the amino acids (5). Does Whey Protein Concentrate become denatured by processing before it is sold? Through excessive heat processing it certainly can be. Luckily enough, denatured whey concentrate is fairly easy to identify. The more denatured the whey, the worse it will taste. If the whey you are using tastes bad with a grainy powdery texture, there is a good chance that it has been denatured with processing. Whey that is loaded with flavorings and artificial sweeteners can also be suspect. If you get the impression that flavoring agents are attempting to cover something up, you may want to consider finding a different brand. So, it’s not OK to cook with whey protein powder? Didn’t quite say that. Let’s take a look at some research to aid us in answering this. In the following study, the digestibility of whey decreased as it was heated over 75°C (167°F) but amino acid availability was the most remarkably reduced when whey was heated to 121°C (250°F) for 5000 seconds. However, whey protein concentrate, heated to 90°C (194°F) for 5 minutes retained 80% solubility (6). With this information one might conclude that it is a horrible idea to use whey in cooking, as most baking recipes require oven temperatures of 350 Fahrenheit or higher! However, it is important to consider that oven temperatures and cooking temperature are not the same. In baking, the product temperatures are not as high as the oven temperature due to evaporative cooling. If you consider cooking pork or chicken, the recommended internal cooking temperature is 160 Fahrenheit, and if you have ever cooked a big pork chop you realize that achieving this temperature can take a fair amount of time. Therefore, although the external temperature of the cooked item is high enough to significantly denature the protein, the interior temperature is much lower and probably won’t cause extensive denaturation. Although heating and cooking with whey protein may potentially adversely affect the solubility and consequently the rate of absorption, I would certainly not dissuade you from using whey in cooking. 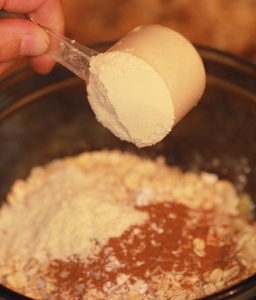 During baking, some of the proteins may become denatured but as this is a structural change, the nutritional content of the whey largely remains unchanged and thus provides essential amino acids which are part of a healthy diet. Consequently, there are no health risks associated with consuming denatured whey and one study actually suggested that it may offer some benefit to those seeking weight loss as the denaturation could delay protein digestion and potentially slow gastric emptying and promote satiety (7). 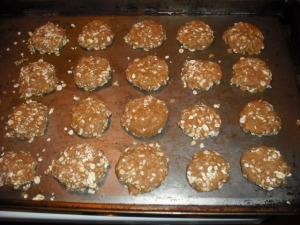 Additionally, common whey baked products include things such as breads, cakes and cookies. These items frequently contain added sugar which appears to increase the heat stability of whey protein (8). Whey protein is a high quality protein and adding it to your baked items make them a more satiating and nutritious food item. Reducing the digestibility of a small portion of this protein through baking is really just a triviality. Pingback: Mike's Mix Recovery Drink » Where does your protein come from?